Distribute beta versions, collect live crash reports, and get feedback from real users. Let HockeyApp empower you to build the world’s best mobile apps. 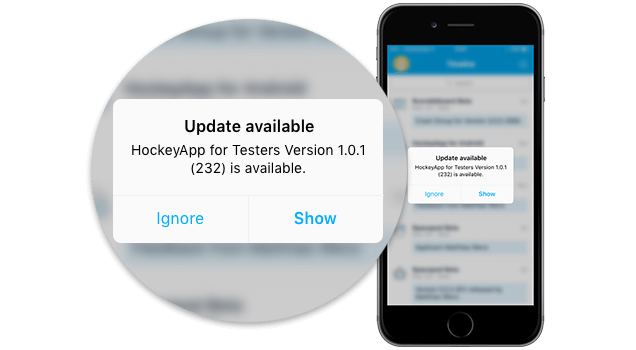 When you integrate HockeyApp’s open source SDK for Android, Cordova, iOS, Mac OS X, Unity, Windows, or Xamarin into your platform, it enables your app to send detailed crash reports to HockeyApp. HockeyApp will symbolicate and group related crashes, so you can see their frequency and prioritize your backlog accordingly. You can also integrate the crash reports with your existing ALM tooling to manage all your work items in once place. Feedback flows directly from your app to your development team. The feedback messages are handled as discussions, so you can engage with your users to gain a deeper understanding of what users really want from your app. You can also integrate the feedback with your existing ALM tooling to manage all your work items in once place. Invite your beta testers and users to find all your apps in one place and install them over the air. Your users will stay up to date with the familiar in-app update process for their platform. You can even require users to update to a specific app version. Integrate HockeyApp into your continuous build process to make uploads and distribution automatic and ensure that your latest version is available immediately. Understand user behavior to improve your app. Track usage through daily and monthly active users. Monitor crash impacted users. Measure customer engagement through session count. Ensure that your apps are being tested on the platforms you care about. Get insight on the beta test coverage you have – what devices were used, what languages were tested, and how long the testers used the app. If you need better beta test coverage through more users, you can create a recruitment page to bring in new users for your app. HockeyApp exposes web hooks and an open API to enable you to use your existing tool chain to its maximum potential. HockeyApp can add work items to your ALM tools based on crash reports and feedback, and you can automate the distribution of your mobile apps if you are already using continuous integration. The HockeyApp extension for Azure DevOps lets you automate your build and deployment process with a few simple steps.